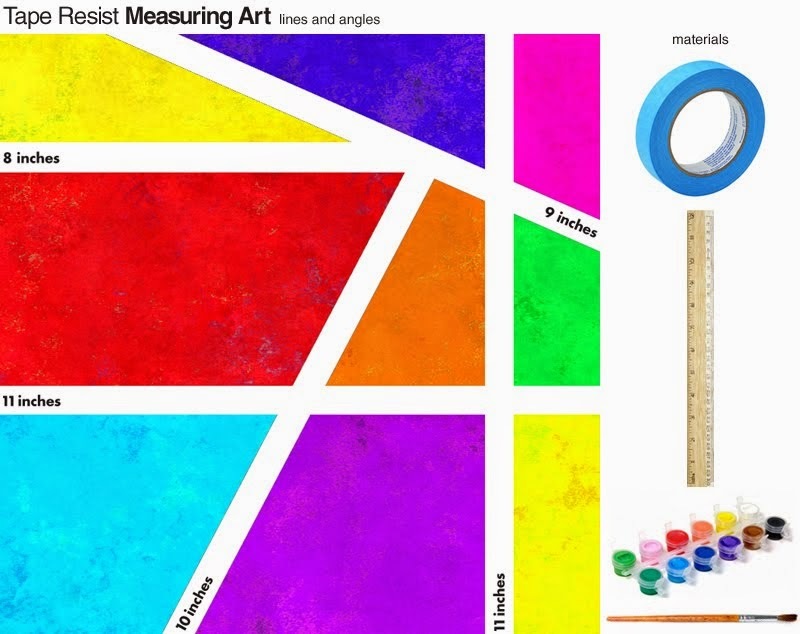 Students explore measuring, while creating aesthetically pleasing works of art. They tear different lengths of tape and place it on their paper (horizontal, vertical, or diagonal). After they place a single piece of tape, they measure it. Then, they write the measurement with pen on top of the tape. Once they're finished taping and measuring, they add color! They can paint or color over the tape. Their measurement lines will stay intact. Just make sure students don't paint over their recorded measurement, what they wrote with pen. After the paint dries, students carefully pull the tape off and write their measurement on their white line (see image). Now, see if they can point out angles in their design. Can they find an acute, obtuse, or right angle? Have them examine their lines. Did they make any perpendicular or parallel lines? Note: If you're working with older students, have them measure their angles with a protractor. What a cool idea! Thanks tonnes!